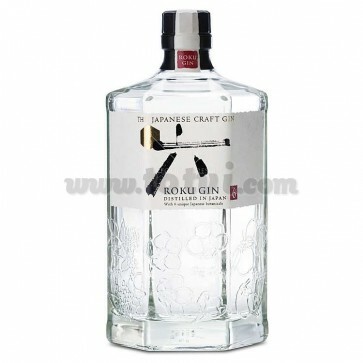 Roku Gin is a premium Japanese artisan gin created by the Suntory Liqueur Atelier distillery, the oldest in Suntory. Gin with a citrus profile and delicate floral aromas, smooth and silky texture on the palate. Made with six delicate Japanese botanicals that make it unique and special. Roku Gin is a premium Japanese artisan gin created by the Suntory Liqueur Atelier distillery, the oldest in Suntory. It is presented in a bottle that embodies the Japanese beauty where the six botanicals engraved in relief are reflected in the hexagonal bottle symbolized by Roku (which means 6 in Japanese) as well as finding a printed label on the traditional paper washi paper and with the daring Japanese written calligraphy. Gin with a citrus profile and delicate floral aromas, a soft and silky texture and a slightly spicy finish. Six delicate Japanese botanicals grown in the beautiful nature of Japan are used for its production: cherry blossom (Sakura) and cherry leaves (Sakura) harvested in spring, sencha tea (green tea) and gyokuro tea (refined green tea) harvested in Summer, Sansho pepper in autumn and Yuzu skin in winter. Each botanical species has been collected at its optimum moment of maturation, to extract its best aromas and flavors, and distilled to incorporate the qualities provided by nature. The harvests of four seasons have been combined to create the balanced flavor of Roku. It is made in the oldest distillery of Suntory founded in Osaka in a unique blend to which 8 traditional botanicals are added (juniper berries, cilantro, angelica root, angelica seed, cardamom, cinnamon, bitter orange peel and lemon peel). ) to create the authentic flavor of gin. As a result of this process, a Japanese soul gin is delivered.